AVON TRAIL ADOPTS A HIGHWAY. mandate. After negotiations with the Ministry of Transport, we were assigned the section of highway No. 7 & 8 from Stratford East Limits to Perth County Road 109, a distance 3.0 km. This is a worthwhile section for the Avon Trail to adopt as it is the last section of road before entering Stratford from the east and is adjacent to a part of the Avon Trail Side Trail. Cleaning up the inevitable garbage along this section will greatly enhance the impression tourists and others get as they approach the city. The goal is to pick up three times a year. Each clean up event would require 10 volunteers. There is considerable emphasis on safety which is provided in the training and guideline resources. 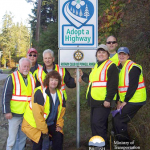 The estimated time to do the roadside clean-up is 1.5 to 2 hours. On completion, team members are invited to enjoy some social time together. We are excited about this opportunity to participate and contribute to this valuable program – helping keep Canada clean. This entry was posted in News Briefs and tagged . Bookmark the permalink.